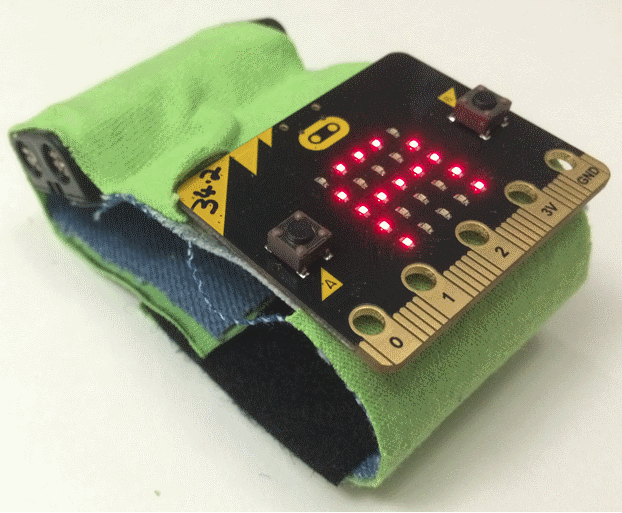 Build your own micro:bit watch from an old pair of jeans and T-shirt! 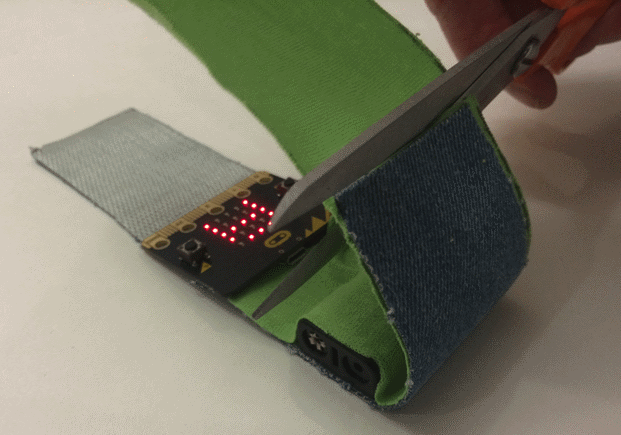 Make a watch for your micro:bit. 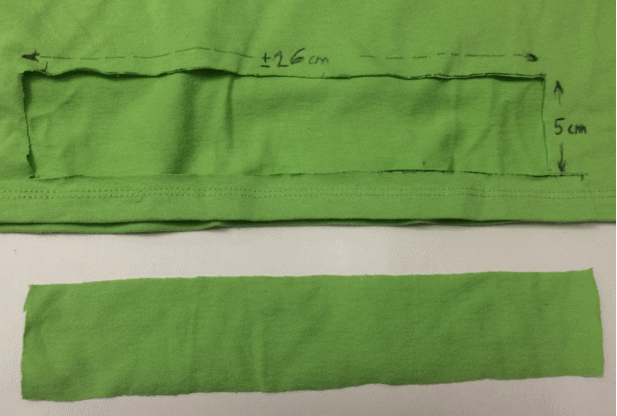 Using the ruler and pen, mark a rectangle of more or less 26cm x 5cm on the T-shirt. Don’t worry if you don’t get it quite right, we’ll tidy things up later on. Cut the rectangle using the scissors. Don’t worry about the quality of the cut, we’ll trim it later on. 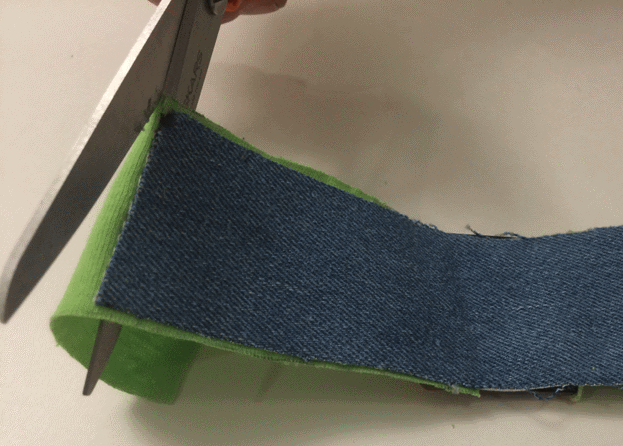 Cut a piece of cloth from the pair of jeans. Cut straight by the seam. 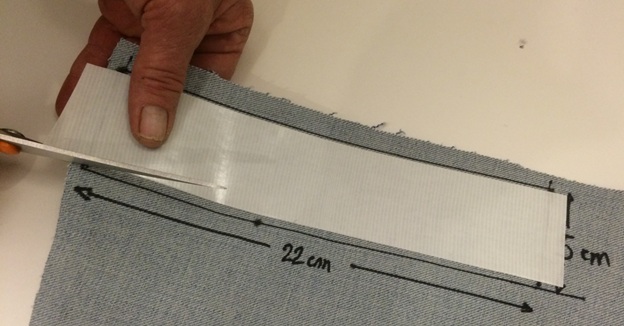 Using the ruler and pen, mark a rectangle of 22cm x 5cm (adults should use 24cm x 5cm) on the jeans cloth. 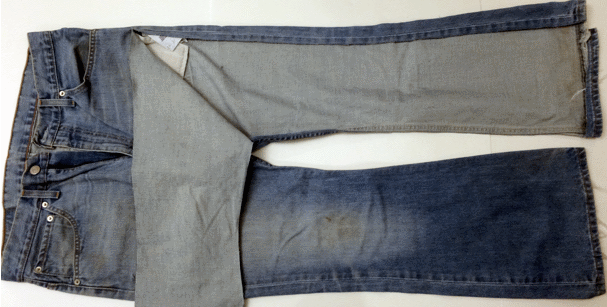 Stretch the cloth using your hands and apply the double-side tape on the rectangle marked on the jeans. You might need the help of a friend to achieve this step. Don’t worry if the tape is larger than the rectangle, we will trim it later. Make sure to apply pressure to the tape to secure it firmly. 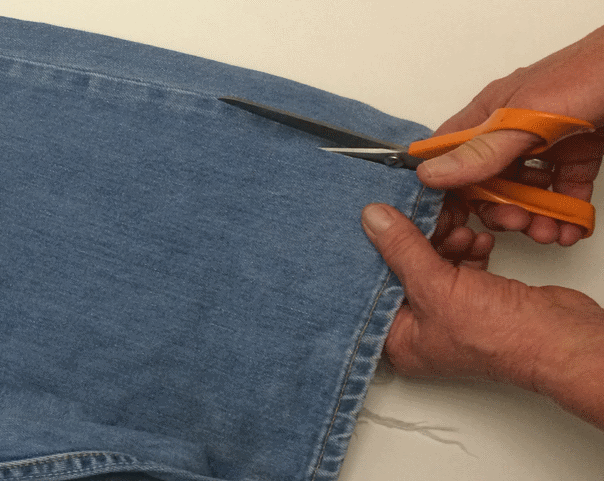 Using the scissors, cut the rectangle of jeans. Peal the tape protective layer from the rectangle. 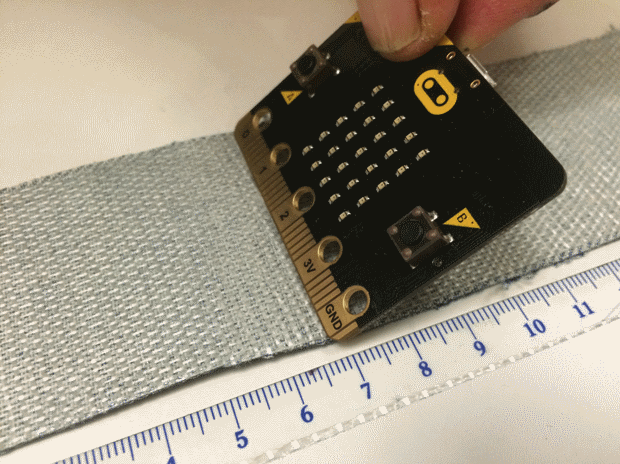 Place the micro:bit pins on the tape at more or less 7 cm from the left border. Then lower the micro:bit on the tape and press gently. 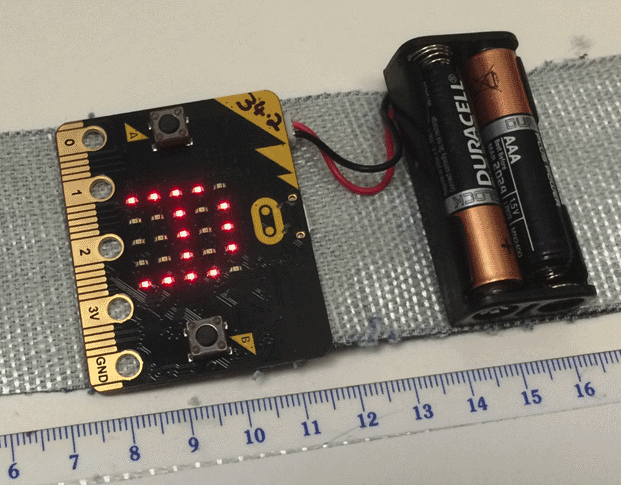 Connect the battery holder and place it on the right of the micro:bit. Tuck the cables away on the tape to protect them. Stick the T-shirt rectangle from the top of the micro:bit, over the battery cables. 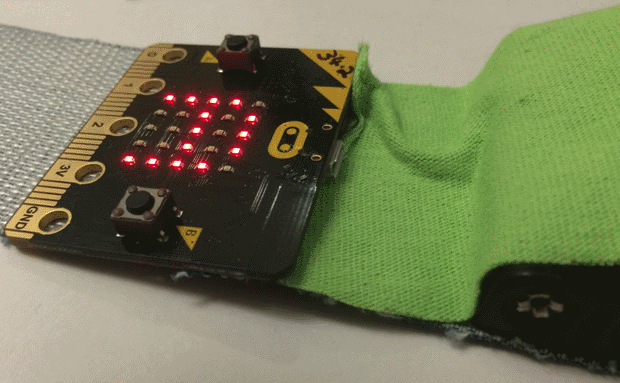 Use your fingers to push the T-shirt cloth under the micro:bit to give access to the micro-USB plug. Place the T-shirt over the battery holder and stick it up to the end. Turn over the watch and cut the extra T-shirt material. Stick the T-shirt cloth on the other side of the watch. 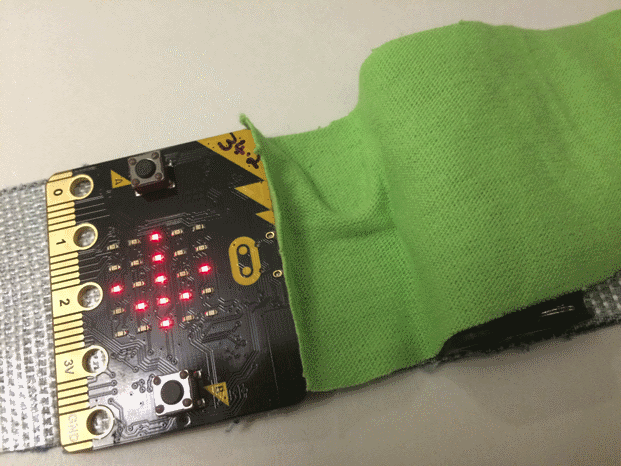 Lift the micro:bit pins to slide the cloth under and leave them free from the tape. Turn over the watch and cut left over T-shirt cloth. 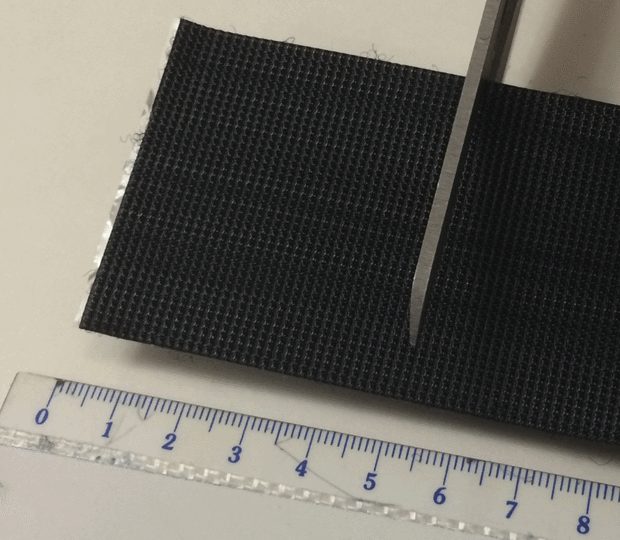 Cut a 5cm x 5cm square of Velcro loops. 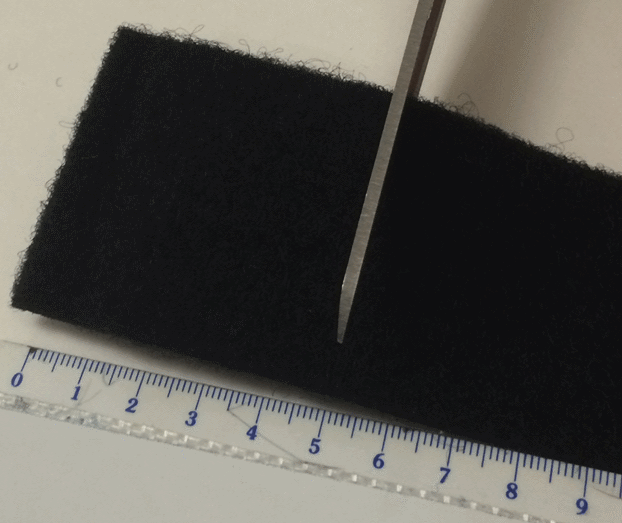 Cut a 5cm x 5cm square of Velcro hooks. Stick the Velcro hooks on the right side of the battery holder on the T-shirt cloth. 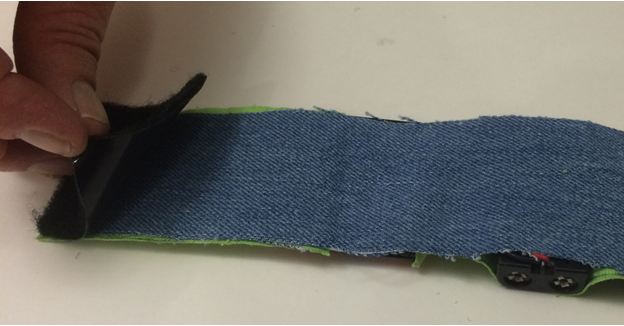 Stick the Velcro loops on the other end on the jeans fabric. 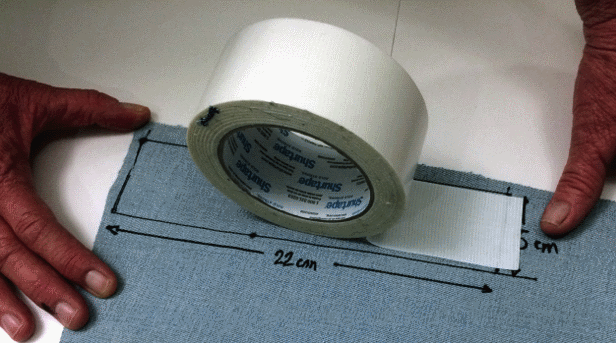 Trim any leftover fabric, threads or tape. Your watch is ready! We’ll now add code to the micro:bit to make it keep time for real! Let’s make a counter for your watch to remember all the motions you make when you walk or move your arm. We need a variable to keep track of how many motions you make. Go into Basic in the toolbox and pull an on start on to the workspace. Ok, in Variables click on Make a Variable. Name the variable as motions. Drag out a set to block and change the name with the dropdown to motions. Place the variable into the on start block. Let’s show that there are no motions counted yet. Get a show number from Basic and put it after the variable. Now, change the 0 to the motions variable from the Variablescategory in the toolbox. Ok, now we’ll count and show all of your movements. Get an on shake block from Input and place it in the workspace. To count each of your movements, get a change by and place it in the on shake. Change the variable from item to motions. Grab another show number and put it at the bottom of the on shake. Find motions again back over in Variables and replace the 0 with it. If we want to start over from zero, then we need to have a way to reset the motion count. Let’s use one of the buttons to do it. Go over to Input and get an on button pressed. Place a set to inside. Change the variable name to motions. Grab another show number and change the 0 to the a motions variable. Yeah! You’re ready to count your movements. Press the Download button to move the code to the micro:bit. Walk around, move you arm, and watch it count! Press the A button if you want to start over. Artistic design by Melinda Hoeneisen.